【明報專訊】WORLD WAR heroes are more likely to be remembered and commemorated than their easily forgotten partners — horses that also went to war. War Horse, originally a work of children's literature, was adapted into a well-known 2011 film. But well before that it had already been made into a stage show. 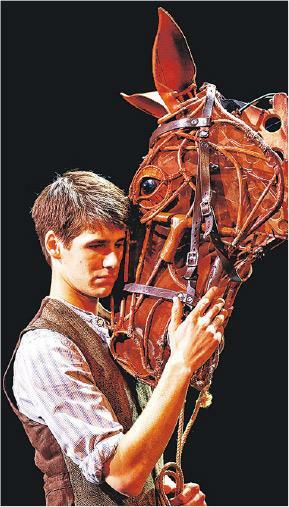 It could be summarised as a combination of puppetry and a heart-warming stage drama about Albert and his horse Joey. Perhaps this is a truism (不言而喻的話) but the show's presentation is comparatively unusual and noteworthy. The production shows how human beings are in ecstatic (欣喜若狂的) communion with nature even during war. In the puppeteers' skilful hands, the liveliness of the "horses" is no less lifelike than real ones. It might be another interesting way to feel the force of nature, blending seamlessly with the thinking of biocentrism which emphasises the value of living things other than dominant human beings. 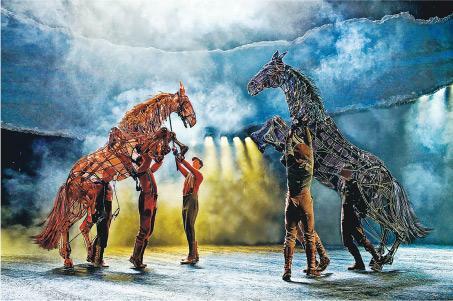 The puppets used in the show are not just various materials — cane, leather, etc — welded together into seemingly bulky horses (43 kilos each just for the body) but also delicate and animate pieces of art for which the audience shall profess their admiration. Since its 2007 World Premiere, the show has become so influential that it has received more than 25 international awards including the Tony Award for Best Play on Broadway.
. The giveaway closes on 17 April 2019. 2 lucky readers will be picked and individually notified. Question: Other than the horses and soldiers, whom else shall we remember?